Who is the best contemporary dancer of this century? Comments for The best contemporary dancer. Instead of saying who the 'best contemporary dancer of the century' is, I would say first that contemporary dance is an art. Art, unless it is commercialized, is not a competitive practice. I understand that you make your self this question because you might have seen contests on television or you might have heard of dance competitions that make our practice look like something of a more sportive character, instead of artistic. But, to answer sincerely to your question, I'd have to say that there is not a best contemporary dancer ever (at least not in the sense of a competition). Contemporary dance is built over other kind of values, like self consciousness, respect of the other, awareness of the present experience, artistic experimentation, honesty and many other possibilities (including physical skills) that grow and evolve constantly. So, if you would like to name a 'best contemporary dancer', you would need to establish from which point of view you want to do a rating. Even if you want to know who the most acrobatic and technically virtuous dancer is, you would need to specify for which specific style or type of contemporary dance. For example, you could have contemporary dancers trained with ballet that are not very good moving at the floor level. Or you could have very fluid and relaxed dancers trained with the release technique, who don't have force to raise their legs. Another example: you could have a great improviser who can not follow the rhythm of music or you could have a great interpreter that learns her/his part perfectly but that is in trouble on stage if s/he has to improvise because something went wrong. Contemporary dance is big, wide and full of possibilities and shades. Competitions are a reduced way of showing contemporary dance in a commercial way. 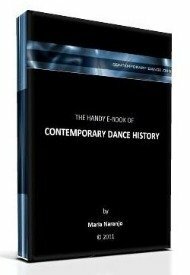 Their judging criteria (usually only acrobatics and expressivity) are indeed part of contemporary dance, but are such a tiny little aspect of it, that I would say that choosing a 'best contemporary dancer of a century' might be inappropriate. Do you really think that answer is possible? I'll be glad to help you with more answers.